The most pressing issue facing Arizona as this 2019 legislative session begins is adoption of the Lower Basin Drought Contingency Plan (DCP). It is crucial that our elected officials take swift action to protect our Colorado River supply and economy by approving the carefully-crafted DCP Implementation Plan, which is supported by an overwhelming majority of stakeholders. Our state needs the certainty of Arizona approving DCP and not the uncertainty of what the Federal Government will impose if we fail to act prior to the January 31 deadline. Since last summer, a broad coalition of Arizona stakeholders have been working out a strategy for implementing DCP in Arizona. DCP requires sacrifices from all water users to prevent far deeper shortages of Colorado River water that would negatively impact the State's economy. By taking less Colorado River water today, Arizona and the other Colorado River Basin States can significantly reduce the risk of disastrous shortages in the future. The majority of Arizona stakeholders have reached a delicate compromise for how to satisfy Arizona's share of DCP water reductions. This carefully-crafted deal known as the Arizona DCP Implementation Plan is like a very tall tower of Jenga blocks, in which the costs and benefits of the plan to each stakeholder balances just right, but will come tumbling down if even one block is added or pulled away. 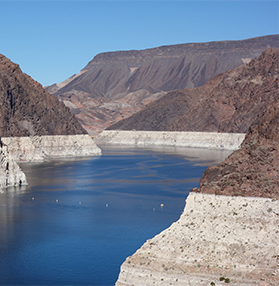 Under the Arizona DCP Implementation Plan, farmers, tribes and municipal users receive mitigation to soften the blow of DCP reductions, while at the same time ensuring Arizona's water in Lake Mead is protected. Funding for mitigation comes from the taxpayers and ratepayers of the Central Arizona Project as well as State, private and Federal entities. The Arizona Municipal Water Users Association (AMWUA), whose members are Avondale, Chandler, Gilbert, Glendale, Goodyear, Mesa, Peoria, Phoenix, Scottsdale and Tempe, support the Arizona DCP Implementation Plan. They have also committed substantial resources in support of the Implementation Plan. This includes agreeing to send 100,000 acre-feet of water to Pinal County farms to help mitigate DCP impacts to Pinal agriculture. Cities also understand that the cost of Colorado River water delivered by the Central Arizona Project will increase under DCP. Those same rates will help fund $60 million worth of mitigation support of Arizona's Implementation Plan. Under DCP, AMWUA cities are agreeing to take reductions in deliveries under water contracts that were acquired at great expense by their ratepayers. However, AMWUA cities recognize that these sacrifices are necessary in order to increase the reliability of Arizona's remaining Colorado River supplies and protect the State as a whole. While details to the Arizona DCP Implementation Plan are being finalized as quickly as possible, the key provisions of this Jenga tower are in place and are supported as of late last year. Unfortunately, Pinal County agricultural interests and the homebuilding industry have reserved their support for the Implementation Plan as they require more certainty. AMWUA members understand this, as we are prepared to confront the new reality of reduced Colorado River supplies. All water users face a new degree of uncertainty. Yet, the Implementation Plan already provides more water to Pinal County agriculture than they would receive with no DCP. In fact, taxpayers outside of Pinal County will be funding the vast majority of the $135+ million cost for the mitigation of Pinal Agriculture, which represents roughly 0.2% of Arizona's economy per a recent University of Arizona economic study. The homebuilding industry has also requested mitigation water under the Implementation Plan. The problem with this request is that they do not have a contractual right to Colorado River water, and there is no more water available in the Implementation Plan. Despite this reality, many of the new homes they envision can still be built thanks to a separate agreement between the Central Arizona Project and the Gila River Indian Community, which would provide over 900,000 acre-feet of water (25 years-worth of water) for development. Seeking to gain further water supplies as part of the Arizona DCP Implementation Plan will unravel the entire deal. It is the absence of DCP that truly threatens the certainty of homebuilding and all other industries in Arizona. The time is now for the Arizona Legislature to focus on the well-being of the whole state and ensure Arizona signs onto DCP. The ten AMWUA cities provide the water to the industries and businesses that drive the economic engines of Arizona's economy. Arizona's industries, businesses and residents are relying on the Legislature to approve DCP and protect our water future. Please encourage your Legislators to approve DCP based on the Arizona DCP Implementation Plan. For 50 years, Arizona Municipal Water Users Association has worked to protect our member cities' ability to provide assured, safe and sustainable water supplies to their communities. For more water information visit www.amwua.org.